Money is a topic that looms large in the minds of most of us. We worry about the lack of money, we hope for a raise at work, and many of us dream of hitting it big with a lottery or windfall. Yet, money is a topic that is seldom addressed at churches. 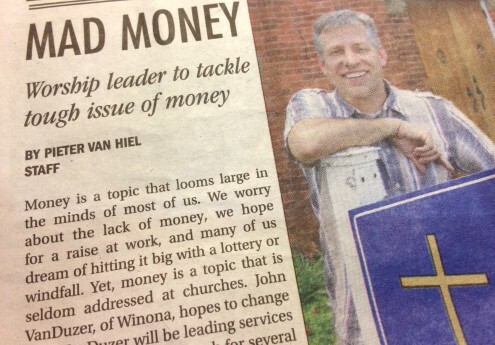 John VanDuzer, of Winona, hopes to change that. VanDuzer will be leading services at Smithville United Church for several weeks while pastor Gary Patterson is on sabbatical. VanDuzer intends to deliver a series of sermons on the role money plays in all of our lives. He has entitled the series, “Loonie,” a reference to both the dollar and unusual nature of the series, and his own expertise on the topic. VanDuzer is perhaps a little self-effacing when he says he is not qualified to speak about money. He is also the president and creative director of wishart, a Hamilton marketing organization that specializes in building fundraisers for charities and non-profit groups. According to the corporate webpage, since its foundation wishart has helped clients raise about one billion dollars. VanDuzer believes the Bible has more to say about money than people realize. He believes money was a key theme of the gospels, as well as Christ’s Sermon on the Mount. VanDuzer believes this shallow engagement with the topic creates common misconceptions among Christians. Some think of money as the root of all evils. VanDuzer disagrees, but he also questions the “prosperity gospel,” the idea that good Christians will receive a tangible fiscal reward. “Money is not the root of all evil. The Bible says the love of money is the root of all evil. I’m not a prosperity theologian. I’ve read them and I’m referencing them. I say kind words. But I’ve also got criticism,” he said. VanDuzer’s series will not provide specific advice about investments or the morality of money, but examines the question of why western society is both rich and troubled. VanDuzer said each person would have to engage individually with his presentation and come away with his or her own conclusion. VanDuzer’s series of talks begins Sunday, Sept. 8 at the Smithville United Church at 10:30 a.m. The church is located at 116 West Street in Smithville. John VanDuzer will serve as the worship leader at Smithville United Church for several weeks in September. The Winona-based graphic designer and fundraiser will talk about the role of money in our lives.